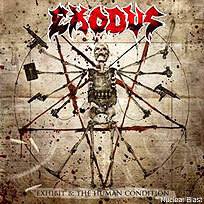 The track, a pounding number with a memorable off-time riff, a stomping chorus and a sweet twin guitar lead from Gary Holt and Lee Altus is an acrid, blood-flecked taste of 'Exhibit B: The Human Condition,' an excellent follow-up to 2007's 'The Atrocity Exhibition -- Exhibit A.' The new album is scheduled for release May 18. The lyrics for 'Hammer and Life,' which include the lines "I live for the here and now I live for the knife/My code of arms is a hammer and life" are pretty representative of the violent tone of the record. "The theme on the last album was more about religion. This one's more about the ugliness of mankind and our ability of committing the ugliest, most brutal acts," Exodus guitarist and songwriter Holt told Noisecreep. Exodus are currently on the road with Testament and Megadeth on the 'Rust in Peace' 20th Anniversary Tour. Dates run through March 31 in Los Angeles.